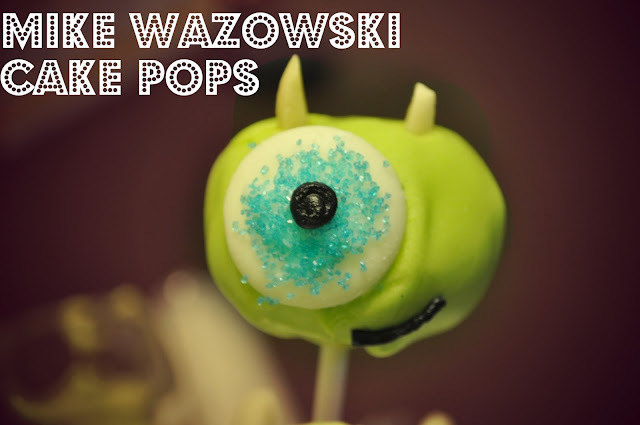 Monsters University was released today and in honor of such a momentous occasion I decided to celebrate with some Mike Wazowski Cake Pops! I've been waiting for this prequel for over ten years so what better way to enjoy the movie than with a themed snack? Not too bad right? I used the Paper app on my iPad with my trusty Adonis Jot Pro Stylus. I ended up using a lot of my original ideas except for Mike's little horns. Instead of Peanut Butter Chips I used Slivered Almonds. They had the same tan color I needed, plus they were a lot easier to get into the cake pop. The recipe to make these are actually really simple, it's just the dipping and decorating part where thing get a little more time consuming. For the sake of time and my sanity, I used a box cake mix and canned frosting, but I spruced things up a bit by adding a package of Pistachio Pudding to both. I wanted my cake pops to be green on the inside and the outside...plus I just really love pistachios! Once your cake is all baked and cooled, it's time to destroy it. I know, it seems like a barbaric baking act, but we can't very well make cake pops from a whole rectangle cake now can we? Every cake pop recipe I've seen suggests you cut the cooled cake into four pieces, take two of them and rub them together to "crumb" them up. I tried that for about five minute before I decided that a food processor would make this whole process a lot faster, less messy and more fun. Isn't that a fun shade of green? After my cake was all crumbed up I mixed in a little more than half my frosting into my cake crumbs. You can try to just stir everything together but to ensure equal coating you have to get your hands all up in the mixture. Don't worry about your hands being covered in cake, you'll be rolling cake balls so they were going to get dirty anyway. I needed my cake pops to be a bit on the larger side since I needed Mike's signature eyeball to fit on it so I was able to get about 26 1 1/2" cake balls out of my cake mix. I melted a few green candy melts, dipped the end of a cake pop stick in it, then put a stick a little more than halfway through each cake ball. Some recipes say to do this after the cake ball is already chilled but I thought freezing them with their sticks pre-dipping would help me avoid my cake balls falling off the stick and drowning in a pool of candy melts. To save some time, I made my Mike eyeballs while my cake balls were getting nice and chilly. 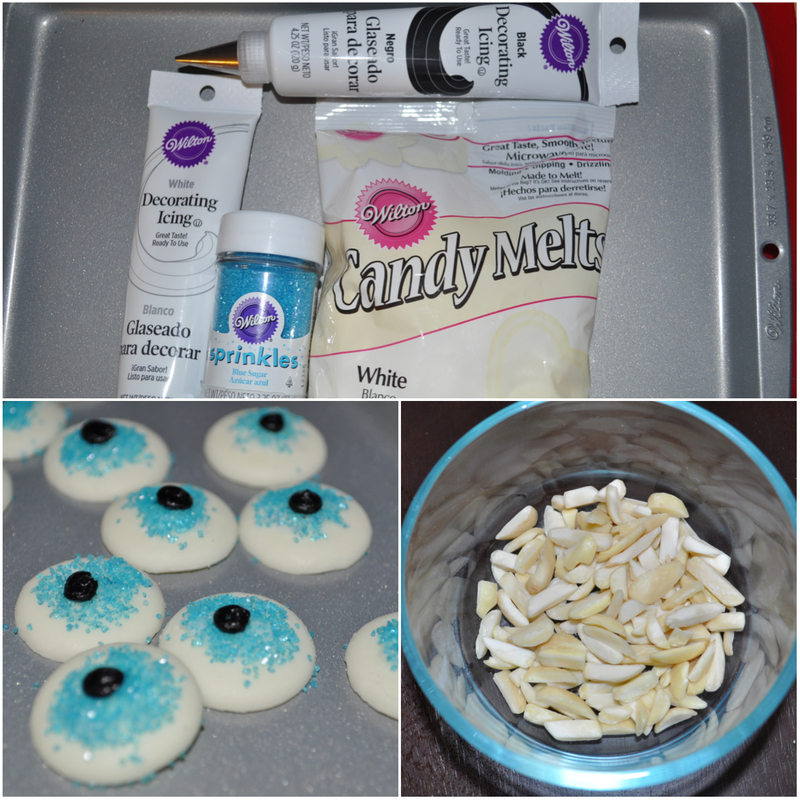 I used a white candy melt, added some white decorating icing in the middle, dipped the top of the candy melt in blue sprinkles and used some black decorating icing with a #4 tip for the pupil. I got a lot more sprinkled than I wanted on some of them but it's really easy to just brush them off with a small paintbrush. 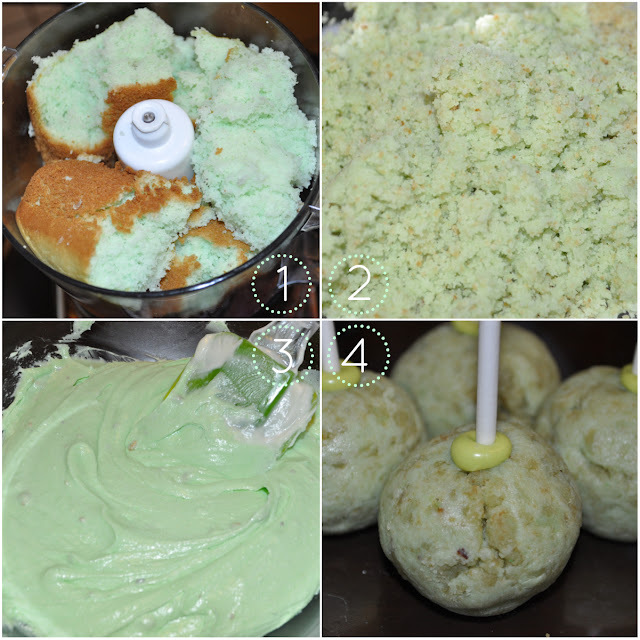 After the cake pops had chilled for an hour, I melted up some vibrant green candy melts and began to dip! Once your Mike Wazowski is coated and you've let the excess candy melt drip off, stick the eye on as well as his Slivered Almond horns. The almonds are pretty long but they are easy to stick into the cake pop while the coating is still wet. The coating dries pretty fast so you'll have to work quickly! I stuck my cake pops in a styrofoam base so they would stay upright while they dried. Once Mike is nice and dry, pipe on a grin! Isn't he cute? I didn't want to eat them because they were too adorable but I know my little brothers will have no problem nomming on these little monsters! 1) Follow cake mix directions and ingredients. 2) Add Pistachio Pudding Mix to batter and mix until blended. 3) Follow cake mix baking times and directions. 1) Use a rubber spatula and empty the canned frosting into a medium bowl. 2) Add Pistachio Pudding Mix to frosting and mix until well blended. 1) Once cake is baked and cooled, cut into equal pieces. Use a food processor for about 20-30 seconds to "crumb" up the cake. Depending on the size of your food processor you may have to do this in batches. 2) Put crumbed up cake in a large bowl, add a little more than half of the Pistachio Frosting to the crumbed cake. Mix until all crumbs are coated and the mixture is sticky enough to roll. 3) Roll mixture into uniform sized balls. Place rolled cake balls in a pan or on a cookie sheet in a single layer. 4) Melt 1 Tbsp. Vibrant Green Candy Melts in microwave on 50% power for 30 seconds. Repeat another 30 seconds until mixture is smooth and runny. 5) Dip end of cake pop stick into the green candy melts and stick halfway into cake ball. Repeat for remaining cake balls. Place cake pops into the fridge/freezer to chill for an hour or so. 6) Eyeballs: while the cake pops are chilling make your eyeballs. Take a White Candy Melt and add some White Decorating Frosting in the center using a small paintbrush. Dip iced side of Candy Melt into the Blue Sugar Sprinkles, wipe off excess sprinkles and try to keep the sprinkles in a circle as will be the iris. Fit your Black Decorating Icing with a coupler and #4 tip. Pipe pupil directly onto the sprinkle iris. Set aside let the icing harden. 7) Remove cake pops from fridge or freezer. Melt 1 bag Vibrate Green Candy Melts according to direction in a small, deep bowl. This will make it easier to coat the cake pop all at once instead of having to spoon the coating on. 8) Take cake pop and carefully dip into the melted candy melts. Dunk into the center and swirl around gently to ensure the entire cake pop is coated. Use spoon for trouble areas if necessary. 9) Hold cake pop at an angle over the bowl of candy melts and let the excess coating drip off. Tap lightly on your fist holding the cake pop stick to help get the excess coating off. 10) Once your cake pop is completely coated, hold up and place eyeball on while the coating is still wet. Stick into a styrofoam base to set and add 2 Slivered Almonds into the cake pop for horns while the coating is still wet. Once your cake pop is dry, use the Black Decorating Icing fitted with a #4 tip to pipe on a smile. Dude. This.is.awesome. I love Mike Wazowski and Monsters Inc. Great photos and directions - easy to understand, even for me... hehe. Happy Friday! Wow amazing!! I loved the photos and it looks like something I could do, but I know I can't. However, Miranda has a connection to Monsters U and we may do a Monsters party at some point so I'll use your recipe when I try. I also love pistachio! Great job! @Trina: Ooh fun! I hope you make them! They were delish! I just wish I could have incorporated chocolate into it somewhere! So, so cute! And I love the addition of pistachio. It's one of my favorite flavors too. You did such a GREAT job with these. Definitely pinned... enjoy every bite of those treats!